Welcome to the website of Dr. Mujahid Saeed, MBBS, MRCP(UK)(Endocrinology and Diabetes), FRCP(UK), AHEA. He is a Consultant Physician in General Medicine & Diabetes (Consultant Physician and Diabetologist) at Queen Elizabeth Hospital Birmingham, University Hospitals Birmingham. He also holds an Honorary Senior Lecturer position at the University of Birmingham. He trained in General (Internal) Medicine & Endocrinology and Diabetes at the prestigious and world renowned Oxford Centre for Diabetes, Endocrinology and Diabetes (OCDEM). He offers private patient care in General Medicine, Endocrinology & Diabetes (Consultant Physician, Endocrinologist and Diabetologist) at the BMI Priory & BMI Edgbaston Hospitals, Birmingham. 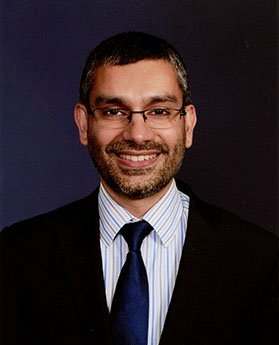 Dr Mujahid Saeed is an expert in the treatment of type 1 and 2 diabetes, obesity (both for people with and without diabetes), high blood pressure and cholesterol, diabetic complications, overactive and underactive thyroid disease (hypothyroidism and hyperthyroidism), amongst several other endocrine and diabetes conditions. He specialises in the use of all new treatments for diabetes, including weight reduction medication (whether living with diabetes or not), newer insulins, insulin pumps and continuous glucose monitoring systems. He also runs a weight loss clinic with the anti-obesity medication, Saxenda® at the BMI Priory and BMI Edgbaston Hospitals, which complements his weekly NHS obesity clinic at the Queen Elizabeth Hospital Birmingham, University Hospitals Birmingham. He has presented on obesity at the All-Party Parliamentary Group (APPG) on Obesity at the Houses of Parliament. He provides efficient Diabetes, Endocrinology and General Medicine related services which is highly regarded by his patients due to the open communication. He keeps his patients up-to-date with their tests. He also provides diabetes related education and Consultancy services in order to improve the profile, knowledge and research in the field of diabetes. He is an author of several publications in peer-reviewed journals and Associate Editor of The British Journal of Diabetes. Book an appointment now to see Dr Mujahid Saeed. Insurance, self-funding and international patients are all welcome.